“Hot cross buns, hot cross buns, everybody loves hot cross buns!” are the words to the children’s song and they hold true even now. 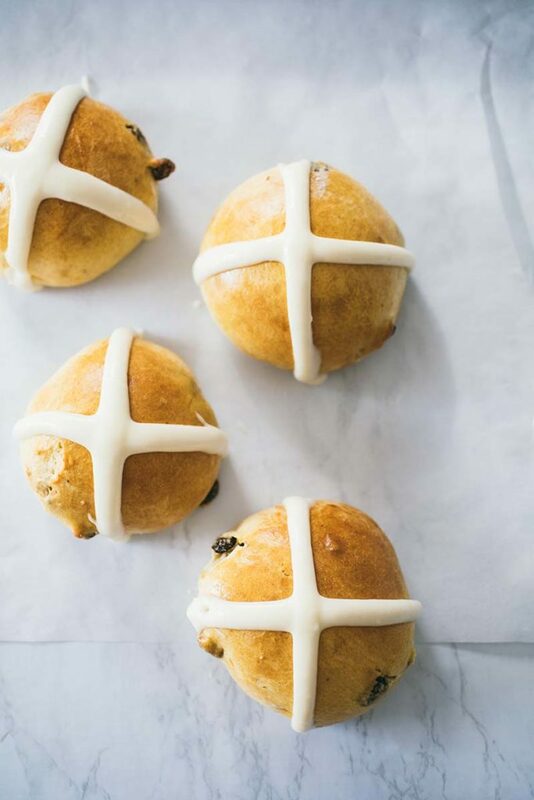 These little buns are traditionally served at Easter time: A sweet dough, spiced, studded with dried (sometimes candied) fruit and decorated with a cross made of icing. I made them after many requests and my kids devoured them within minutes; they were nervous about the raisins, but the cream cheese crosses and scent of cinnamon and nutmeg drew them in. If you follow along on Instagram, you can watch us make the buns in our Instagram stories. The recipe comes from our latest book, Holiday and Celebration Bread in Five Minutes a Day, which also has a whole chapter on Easter bread recipes. To make the icing: mix the cream cheese, butter, confectioners’ sugar, and maple syrup in a small bowl. A sweet dough, spiced, studded with dried (sometimes candied) fruit and decorated with a cross made of icing. We’re giving away one (1) copy of the new Holiday and Celebration Bread in Five Minutes a Day cookbook to three (3) randomly chosen winners. My mom’s homemade cinnamon rolls were always a favorite. I use to love Hot Cross Buns but have not had any for years. This recipe looks like a great one to try. Thank you for sharing the recipe. I have had difficulty in finding Red Star Yeast. Please tell me which grocery stores in Virginia Beach, Virginia stock it. Thank you. Our store finder (https://redstaryeast.com/stores/) shows Harris Teeter and Walmart Neighborhood Markets carry some Red Star Yeast products. Hot Cross Buns! I’ll need to try this recipe! My favorite Easter baking tradition is making fresh rolls for Easter lunch and also making peanut butter eggs. The hot cross buns look great! 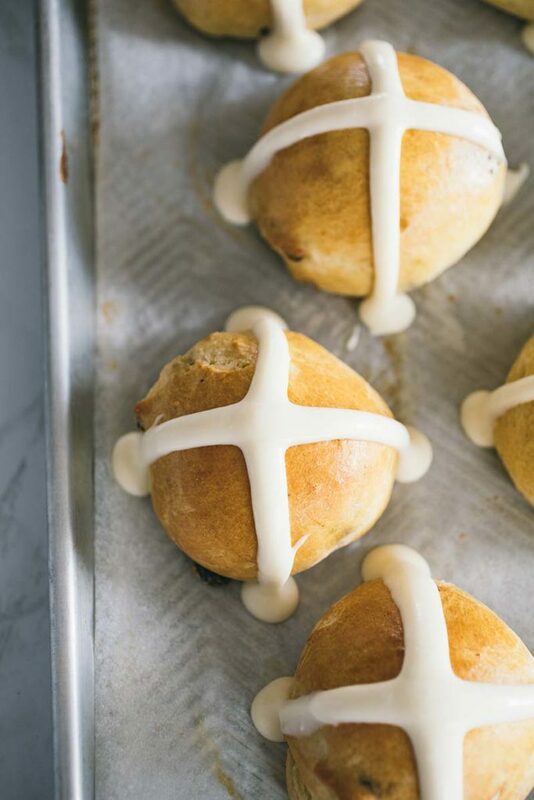 We normally make Easter bread in our home but maybe we will have to give these a try too. Homemade dinner rolls to go with the ham and fixings. Have never tried them, but have thought about it a few times since they do look good! I like to make cinnamon rolls for breakfast! Our little family is just starting out so I need to figure out some baking traditions! I do love baking but I’ve never tried hot cross buns, this might just be the year!! I like making homemade rolls. 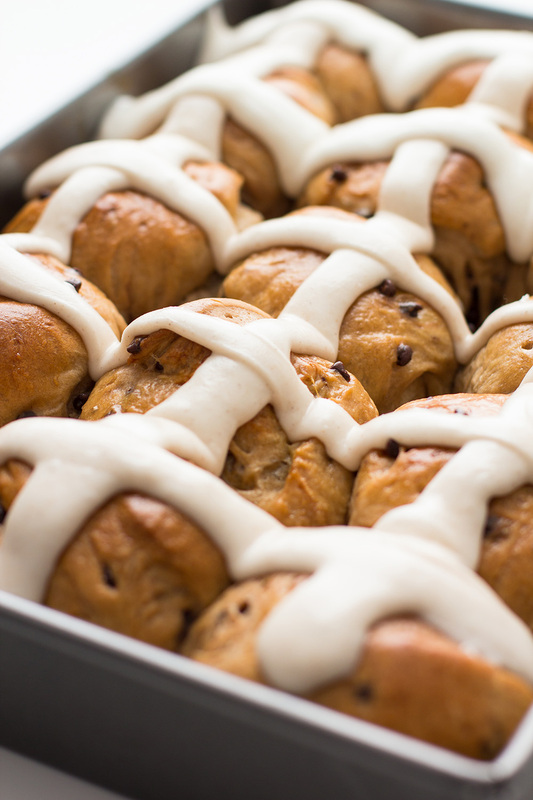 These hot cross buns look delicious! I might need to start a new family tradition! Cinnamon rolls and buns for yummy ham sandwiches! I love cinnamon rolls with orange icing. I enjoy baking with my granddaughter. I love making big bakery style cinnamon rolls for Easter morning and dinner rolls for our Easter dinner. Delicious recipe and super easy to follow. Will definitely make again! Freshly made orange nut bread for breakfast. Always some kind of sweet. Cinnamon rolls, sticky buns or crumb cake. I made Hot Cross Buns for the 1st time Friday – 2 doz. They were so good that I made more on Saturday to give as gifts!!! Yummy!!!!! Rolls so you can have ham sandwiches after Easter Dinner! I start the holiday by making hot Cross Buns on Good Friday and freezing one for the next year its tradition, then on Saturday I love coloring Easter eggs with my family, then I bake all day Saturday making Easter breads. I love to make holiday breads such as hot cross buns and paska! I bake yeast rolls for dinner, monkey bread for breakfast, and a decadent chocolate cake for dessert–all from scratch. Love to bake fresh dinner rolls to go with our Easter ham! I help my friend’s bake Kolaches and have fun eating them as well. We love to make rolls. The rolls aren’t too sweet. There’s enough sweet stuff already on the table! 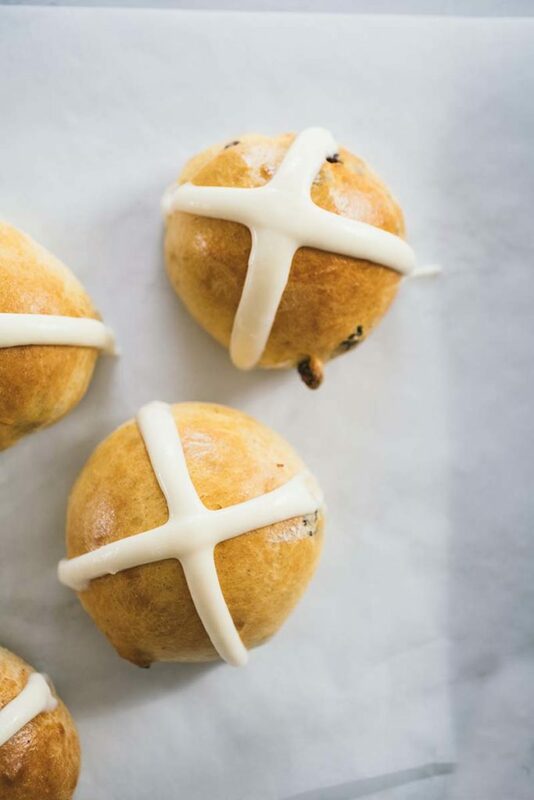 We’ve never had a tradition of hot cross buns, but printed and will start one this year! look forward to making the Hot Cross Bun recipe. I like to try new recipes. I am looking forward to trying these recipes. I enjoy using Red Star Yeast products. my favorite Easter baking is Greek Easter bread. it has red dyed eggs in a round braid. love Easter twisted sweet bread with golden raisins, it has many names like paska, babka, ect… so good, also many different types has just raisins, or and candied fruit in it. SINCE I CAN NOT PRINT ON MY PRINTER, I HAVE TO WRITE DOWN EVERYTHING BY HAND. BUT MY GREAT GRANDMA AN MY GRANDMAMA BOTH TAUGHT ME HOW TO BAKE FROM SCRATCH, AN THAT IS WHAT I DO. I AM NOW JUST ABOUT 80 AN STILL DO THAT. I LOVE TO DO ROLLS AN HOT CROSS BUNS FOR EASTER. WE USE TO HAVE A BIG FAMILY COME TO THE FARM IN CONNECTICUT. 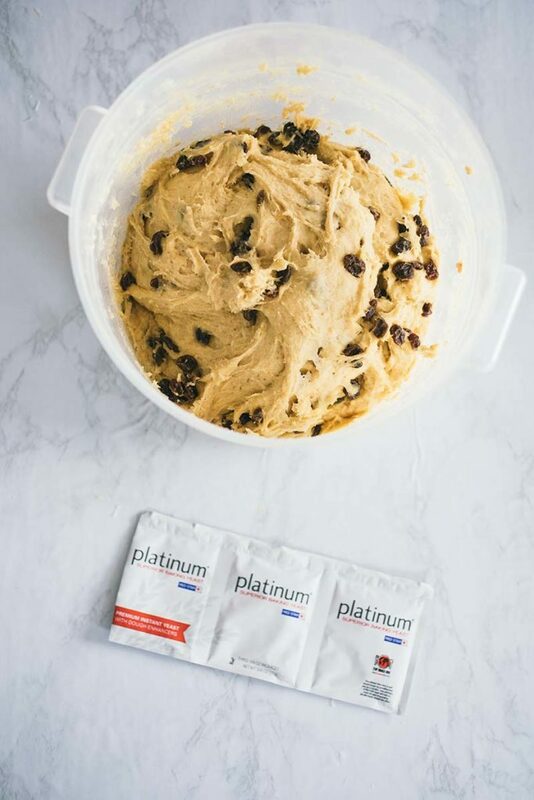 SO WE WOULD BAKE A LOT FOR THE HOLIDAYS. Love, love, love these books. My family looks forward to each new bread I try. Hot Cross Buns this week. In the past, I always baked cinnamon or hot cross buns for breakfast and cloverleaf rolls for Easter dinner. My wonderful mother-in-law, Ossie, introduced me to yeast baking 43 years ago. Haven’t stopped since! 😃. Happy Easter, everyone! My family favorite Easter (and Christmas) holiday baking is my grandmother’s Hungarian Nut Rolls. Brings all the family memories back and to celebrate our roots. Hot cross buns are a favorite. My favorite Easter tradition is coloring eggs! 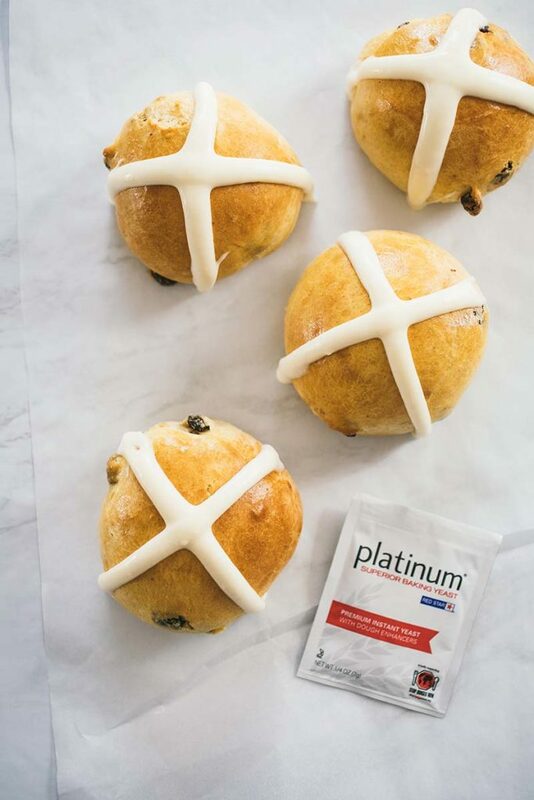 I’ve never made hot cross buns (not sure I’ve even tried them) but they look great. I suppose my baking tradition would be to make some sort of dinner roll. No specific recipe as I’m always trying new things. Portuguese Easter yeast bread that my mother makes every year. Also my mother’s wonderful shortbread cookies, and swirl cookies that she’s baked since we were kids. Just fabulous. Every year she out does herself. Hot cross buns are usually a pre-Easter tradition for me, and I bake them during the week or two before Easter. But for Easter itself, carrot cake is always on my baking to-do list! These look delicious! Can’t wait to make them at home. My favorite Easter baking tradition is making Ukrainian Nut Rolls. My tradition is making Easter babkas as gifts for family members. Everyone looks forward to them. My favorite Easter baking tradition was visiting my Grandparents and making holiday treats with Grandma! It was then as a little girl I got my love for baking from scratch. Whenever I miss my Grandma I simply bake bread and she seems a little closer. Hot Cross Buns were and still are my favorite Easter tradition! I really enjoy the bread n rolls recipes that I have tried with red star yeast products. My favorite tops are potato bread, dinner rolls. But I enjoy al the items that I make for my family. I love to make hot cross buns.